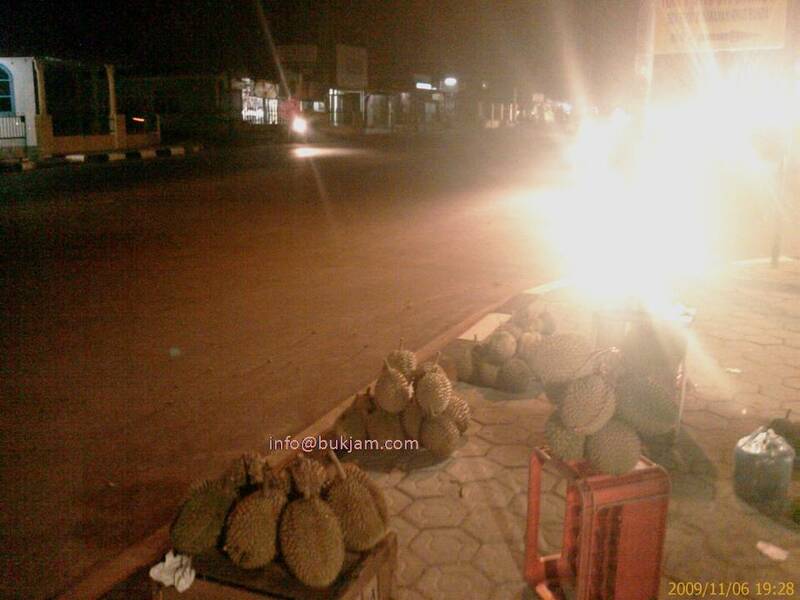 Durian (Duren) bangka | Bangka Urang Kite Jitjong A.M.
Do you want this picture? please contact Community Service Officer at cso@bukjam.com!!! I will not describe durian for you unless you see the below picture and taste it. end of story! The Hakka’s word for durian is Liu Lian. In the early days, for Hakka durian is a new strange fruit. They call it durian but in Hakka‘s accent, comes out Liu Lian. In the early of year 1900, there was a famous place for durian, called Liu Lian Thew (Durian Center). Why so call? Because there is a famous durian farm belongs to Chin A Jok. One of my ancestor. During the dutch colony and japan invasion people always come to find durian to this place. There is a nice story during a japanese invasion. 1942.One day 3-4 young soldiers are eager to eat durian. After asking several persons, they knew Liu Lian Thew was the place they were looking for. So they went to Chin A Jok’s farm. Serving by his son anxiously, they japanese ate and ate without any intention for paying. Suddenly one of them sound something, and from his pocket came out some coins. He asked about the price. Where to find durian center?In Pangkal Pinang (Pinkong) , capital city of the province of Bangka-Belitung, also has durian center in Lembawai area. Precisely around the Gang Metro’s entrance. In Sungailiat (Liat kong), Jebus, Belinyu (Belijong), they have their own durian center. Tips : Come at night, around 7pm-12pm. When you visit durian center you can find many kind of durians. But there is only one legendary Durian in Bangka, Hakka (Khek) called Cu Ma Si ( Melayu : Tahi babi ), literally means “female Hog’s dung” . This Durian is rarely found and very expensive. Rp250.000/each if available.Very small seeds inside.The taste, aroma and shape is different from its kind.Funny? Dirty name, good taste and bad pocket. but..happy…Remember that! I will not describe durian for you unless you see the below picture and taste it. end of story!The Hakka’s word for durian is Liu Lian. In the early days, for Hakka Bangka durian is a new strange fruit. They call it durian but in Hakka accent, comes out Liu Lian. In the early of year 1900, there was a famous place for durian, called Liu Lian Thew (Durian Center). Why so call? Because there is a famous durian farm belongs to Chin A Jok. One of my ancestor. During the dutch colony and japan invasion people always come to find durian to this place.There is a nice story during a japanese invasion. 1942.One day 3-4 young soldiers are eager to eat durian. After asking several persons, they knew Liu Lian Thew was the place they were looking for. So they went to Chin A Jok’s farm. Serving by his son anxiously, they japanese ate and ate without any intention for paying. Suddenly one of them sound something, and from his pocket came out some coins. He asked about the price.There is a legendary Durian in Bangka, Hakka (Khek) called Cu Ma Si ( Melayu : Tahi babi ), literally means “female Hog’s dung” . This Durian is rarely found and very expensive. Rp250.000/each if available.Very small seeds inside.The taste, aroma and shape is different from its kind.Funny? Dirty name, good taste and bad pocket. Remember that! Wah bos, gambar duriannya bagus. Foto sendiri ya? Jadi kangen sama bangka nih. hmmm…kalo bijinya kecil mirip “monthong” dong….mau hunting ahhh.